Karate or karate-do is a martial art of Okinawan origin. Rather than being the product of any one person, culture or era, karate is a synthesis of various Okinawan fighting methods, enhanced intermittently with a mixture of techniques from various Chinese martial arts. In modern times, it has been categorized by some as budo, introduced to the Japanese main islands from Okinawa in 1921 by various Okinawan practitioners who migrated to Japan during the early 20th century. One who practices karate is sometimes referred to as a karate-ka. Karate emphasizes striking techniques, such as punching and kicking, knee/elbow strikes and open hand techniques. However, grappling, joint manipulations, locks, restraints, throwing and vital point striking are inherent in the finer points of the kata. Simple punching and kicking is too one dimensional to be called true karate. In general, karate training is divided into three major areas, kihon, kata and kumite. Kihon is the study of the fundamental moves, the basic components, required to perform the art. Kata means ‘form’ and is a series of movements and techniques, linked together by the principles that the kata expresses, represented as a fixed sequence of moves against imagined opponents. Kumite means ‘sparring’ and develops from well-defined kata to open sparring. It is important to remember that the kihon/kata/kumite division of curriculum is by no means a complete representation of the sum of the art, nor is it the most ‘traditional’ approach. There are many different expressions of karate technique found in different styles, teachers and cultures, and none may be regarded as inferior or superior without a thorough experiential knowledge of the art. Shotokan is a school of karate, reflecting the style of the initial students of master Gichin Funakoshi (1868-1957). Gichin Funakoshi was the man who ‘officially’ brought karate from Okinawa to mainland Japan, although Kenwa Mabuni, Motobu Choki and other Okinawans were actively teaching karate in Japan prior to this point. “Shoto”, meaning “pine waces”, was the pen name Gichin Funakoshi used in his poetry, while “kan” means house. Hence shotokan, “the house of pine waves”, was the name of the hall where he trained his students. 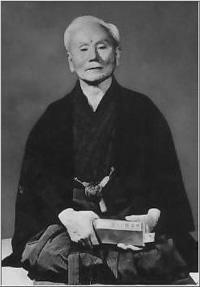 Funakoshi had trained in both of the popular styles of Okinawan karate of the time: Shorei-ryu and Shorin-ryu. After years of intense study of both styles, Master Funakoshi arrived at a new understanding of martial arts, and a simpler style was created, that combined the ideals of Shorei and Shorin. He combined and modified the styles, and made his own, though he never named it, always referring to it simply as “karate”. The karate that he transmitted to his students reflects the changes made in the art by Anko Itosu, including the Heian/Pinan kata series. Funakoshi himself changed the names of the kata included in his curriculum, in an effort to make the “foreign” Okinawan names more palatable to the then nationalistic Japanese mainland. In several cases, Shotokan kata have been modified, in some places favoring athleticism over practicality. An example of a modified kata is found in nijushiho where side thrust kicks were added. As mentioned previously, training is usually divided into three sections: kihon or “basics”, kumite or “sparring”, and kata (forms or patterns of moves). Shotokan techniques in kihon and kata are characterised by deep, long stances which provide stability, powerful movements and also helps strengthen the legs. Strength and power are often demonstrated instead of slower, more flowing motions. The kumite techniques mirror these stances and movements at a basic level, but progress to being more “free” and flexible at a higher level. Funakoshi is said to have found the traditional martial arts (such as sumo, jujutsu and kenjutsu) to be too focused on combat, and he put more emphasis on health, breathing, releasing energy and outstanding mind and body control. Shotokan can be regarded as a ‘hard’ and ‘external’ martial art.